Exercises: There are no exercises for this week's section. As long as you attend your section, you will get the points. Exercises: Solve the following one (1) problem on paper (or solve on computer and print it out) and bring a paper copy of your PHP solution code to section to turn in. You may want to consult the Friday lecture slides on web services. You can check whether a given value is a number by calling PHP's is_numeric function, which accepts a value as a parameter and returns true or FALSE accordingly. One problem with factorials is that the numbers become large very quickly. PHP's built-in numeric data types can store numbers up to roughly 10306, but that does not allow us to compute factorials over a very large range. If you write your factorial.php service using standard multiplication with the * operator, you will see a result of INF (infinity) starting at an n of around 171. You may want to consult textbook Chapter 12 and/or the Ajax lecture slides. 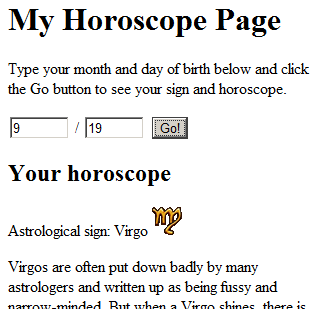 Add the necessary JavScript code so that when the Go button is clicked, the page uses Ajax to show the user's astrological sign and horoscope. (You don't need to modify the HTML file.) Ajax code only works on a server, so you must upload your page to Webster and test it there. Your page uses Ajax to contact a PHP service on webster at the horoscope.php URL below, using a GET request. The PHP service requires two parameters named month and day representing the month and day of birth of the person, and then it outputs the sign and horoscope for that person as HTML code. You should fetch the HTML text sent back by this PHP service and put it into your page in the div with the id of results. Here's what it will look like once you have it working. You don't need to check for valid input or handle any Ajax errors, but it might help you to listen to onFailure and onException events to help find any potential errors. For reference, our solution adds 9 lines (6 "substantive") to the skeleton provided. Exercises: Solve the following one (1) problem on paper (or solve on computer and print it out) and bring a paper copy of your solution to section to turn in. Exercises: There are no exercises for this week's section, because Marty didn't post them in time. As long as you attend your section, you will get the points. You can develop your query on Webster in SSH, or using the following query tester page. 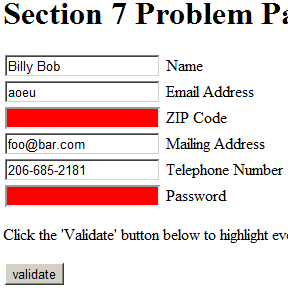 Use the query parameter names meat, veggies, and name to represent the data being submitted. The user can select only one meat at a time. (optional) The text near the check boxes and radio buttons should be clickable. 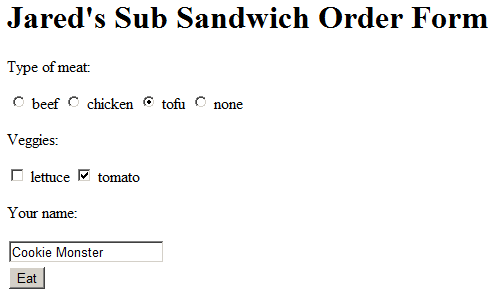 (optional) Initially, chicken should be the selected meat, and both lettuce and tomato should be selected. What CSS must be added to produce the following floating layout? Assume that the width of items like "one" and "seven" in the picture below constitutes 100% of the page width. Exercises: Solve the following two (2) problems on paper (or solve on computer and print it out) and bring a paper copy of your solution to section to turn in. Our section is > all other sections & you know it! The following CSS code has errors that make it fail the W3C CSS validator. Indicate the errors in the code and show a corrected version of the code. Also, add a short comment header to the CSS code and add a new CSS rule that makes all paragraphs use the "justified" text alignment. Exercises: No exercises are due at section this week. Just show up to get the credit. Our sections are 50-minute discussions led by TAs every Tuesday in which the TA "drives" the computer and students help to solve problems together. Thanks to former 190M TAs Stefanie Hatcher and Sylvia Tashev for working on the section code and handouts! 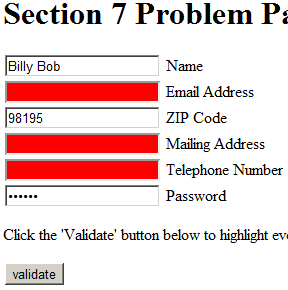 Each week you will complete problem(s) to turn in at your section. Attending section and submitting these problems will earn you participation points for the week. You must attend section in person and hand in the problems at the start of class yourself to get credit. You will not be graded on whether you have a perfect solution, but on whether you have demonstrated effort. Therefore please show some work that demonstrates how you got the answer rather than just writing the answer by itself. We will be somewhat lenient about exactly how the work is shown. Our intention is that these problems would take you at most 30 minutes each week. If you find yourself taking significantly more than this, you may stop your work and write that you worked for 30 minutes. If you have made significant progress, we will still give you credit for your work.